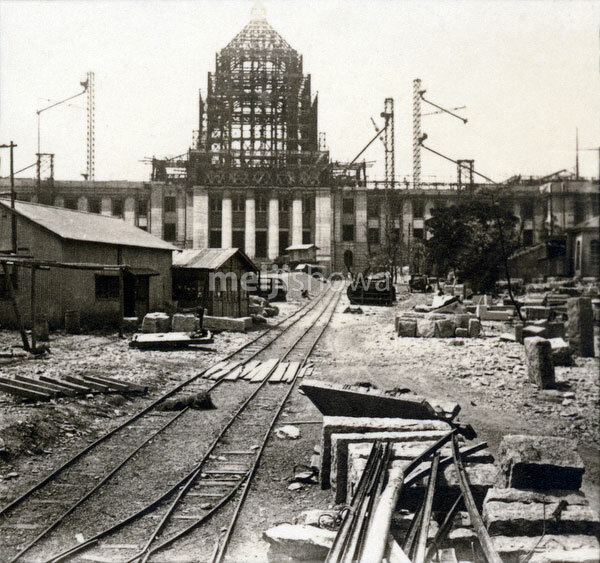 An extremely rare image of Japan’s National Diet Building (国会議事堂 Kokkai-gijido) in Tokyo under construction. The Japanese Finance Ministry sponsored a public design competition in 1918 (Taisho 7) that was won by Japanese architect Fukuzo Watanabe (渡辺福三,1870-1920), who became the principal architect of the building. The construction of the Diet began in 1920 (Taisho 9) and was completed in 1936 (Showa 11).